Not to be confused with Doll. lloD is a smasher from Great Falls, Virginia currently residing in McLean, Virginia who is a professional Peach main in all games in which she appears. He is Rishi's younger brother. lloD is currently ranked 2nd on both the MD/VA Melee and Project M Power Rankings, 14th on the PMRank 2018, and 21st on the 2018 MPGR. 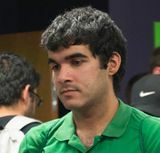 He was formerly ranked 6th on the MD/VA Brawl Power Rankings and 10th on the MD/VA/DE Smash 4 Power Rankings. This page was last edited on April 22, 2019, at 00:13.